A recent report in HR Magazine by David Woods reported “Employers are failing to inspire their staff and make them feel valued, with only 21% of employees believing their company cares about its staff, according to a YouGov survey of over 1,000 workers, commissioned by performance consultancy, River Marketing. This post is taken from my blog "Notes from the workplace garden" where I analyse how creating a great organisation is like creating a great garden. Ric Willmot's Friday Redux No.15: When I want your opinion, will you provide it? Friday Redux No.15: When I want your opinion, will you provide it? Unsolicited feedback is given for the benefit of the sender not the receiver. Don’t concern yourself with those who come offering their criticisms, speculations and the like if you never asked them for it. Are Your Relationships on Purpose? In a four part series, the team at DBL have put together a comprehensive ‘best practice’ guide to graduate development. Although by no means exhaustive, the series is a great resource and useful ‘how-to’ for graduate managers both new to the industry, and for veterans looking for new or fresh ideas to enhance their existing program, enjoy! This article was originally written and posted in January 2008. It is still just as relevant today in 2012 as it was in 2008. People who work in professional services are different. They are knowledge workers. And, they’re unique! They are the means of production. They own it, because it is them. Recruiters? Honest as the day is long! I had a bad experience last week. A bad experience which quickly rebounded into a good one, I am happy to say. It was Friday 6 pm. I was rushing to wrap up things at work. Last minute emails to complete. A call from our Director in Asia with a client issue. A Skype call from our Europe MD. And then my wife on the phone saying don’t forget to pick up the kids. Have you ever thought about becoming or engaging a mentor? Having a mentor can be vital to your successful career plan. While some businesses create structured mentoring plans, sometimes the relationship grows organically and you may already be someone’s mentor without even realising it. If you are in a mentoring relationship, have you given much thought to what that means? Ric Willmot's Weekly Wisdom No.103: What are you doing? Weekly Wisdom No.103: What are you doing? Taking a Stand for the Manager - Underdog of 2012? The role of manager is a multi-talented one! In a four part series, the team at DBL have put together a comprehensive 'how-to' guide for best practice graduate development. Although by no means exhaustive, the series is a great resource for graduate managers both new to the industry, and for veterans looking for new or fresh ideas to enhance their existing program, enjoy! Last week I had a conversation with one of my long-time clients. His issue was, in a nutshell, not having time to do his job because he was too busy doing the job of his staff. 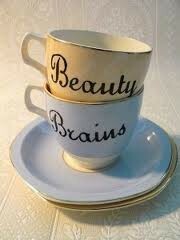 Beauty vs brains......does it have to be a competition?